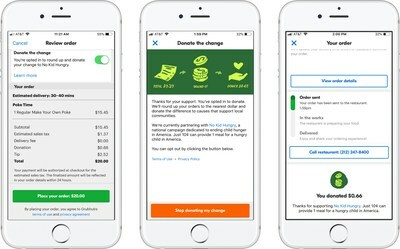 CHICAGO, Oct. 1, 2018 /PRNewswire/ -- Grubhub, the nation's leading online and mobile food-ordering and delivery marketplace, today announced the launch of Donate the Change, a new feature that allows diners to support organizations that help those in need across the nation. To kick off the launch, Grubhub is partnering with No Kid Hungry, a national campaign to end childhood hunger in America. "Grubhub's mission is to connect hungry diners with great local restaurants, but we realize not everyone has that luxury, so we looked for ways we can use our platform to help those in need," said Matt Maloney, chief executive officer of Grubhub. "The introduction of Donate the Change and this partnership with No Kid Hungry allows us to empower our more than 15 million active diners to make a small contribution every time they order to make a huge impact on the life of a hungry child." Starting today, diners ordering online or through the Grubhub and Seamless apps will now be able to round up their order total to the nearest dollar, showing how one person's spare change, when combined with others, can make a big impact. A staggering 12.5 million kids live with hunger in America. All donations made will allow No Kid Hungry to connect kids in need to effective food programs such as school breakfast and afterschool meals. Studies show that when kids get the food they need, they perform better in school, have fewer health problems, and are more likely to graduate from high school. "One in six children lives with the threat of hunger, which can lead to many long-term problems in a child's life. We're grateful to be partnering with Grubhub and its diners to help tackle one of the biggest issues impacting children today," said Tom Nelson, President and CEO of Share Our Strength, the organization behind the No Kid Hungry campaign. "Every dollar donated helps us provide up to 10 meals to children in need. By simply rounding up and donating their change, Grubhub's diners will ensure thousands and thousands of children get the healthy meals they need to succeed." As part of this effort, Donate the Change will partner with a variety of organizations throughout 2019, aligning with causes that support the communities and groups Grubhub serves. For more information and to join thousands of diners in our Donate the Change initiative, please visit https://www.grubhub.com/eat/donate or opt-in online or through the Grubhub and Seamless apps as prompted at checkout.